Is the past your passion? Is your television stuck on the History Channel? Do you crave objects aged and worn, rooms of heavy woods and wrought iron? Is your ideal home more civilized than homogenized, more European than New World? If so, your lifestyle is Italian Impressions Style. It was born in countries on the Mediterranean Sea such as Italy, France and Spain. Countries where sun and soil, culture and custom, inspired charming homes and carefree lifestyles – the sweet life. 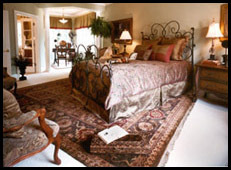 The Italian Impressions Style exhibits a European sense of history and casual elegance. It’s all about heritage and ancient rituals: socializing in the plaza, shopping at the market. 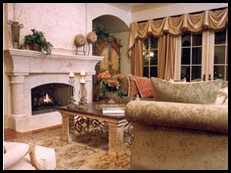 An Italian Impressions Style home, your home, reflects sophisticated living that’s elaborate and gracious. This is a residence of detail and ornamentation. Collected treasures from the past are proudly on display; furniture is of heavy fabric, thickly cushioned and ornate in style. One variation of this style, European Country, showcases mismatched furniture, heavy brocade details, French antiques and tapestries. Tuscan inspired materials, distressed furniture, and natural, old country elements are also its characteristics. Another interpretation of Italian Impressions Style is Mediterranean. Its ornate ceilings and woodwork, period windows, columns and arches create rooms for elegant living and inspired entertaining. Wherever you choose to live in Italian Impressions Style, there are classic “musts”. These include tumbled travertine marble, distressed woods and metals and Patina finishes such as copper and oil rubbed bronze. Your home’s color palette shows greens, golden hues, chocolate browns and wine reds. 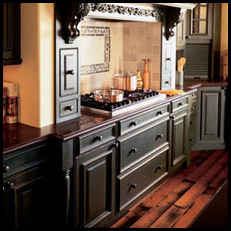 In your Italian Impressions Style kitchen, family and friends experience cherry cabinetry with chocolate glaze and oil rubbed bronze hardware. Natural stones like Granite countertops are a given. Your tile is in the tumbled travertine family featuring mosaic borders mixed with metal decorative tiles. This is the Italian Impressions Style lifestyle. Your way of living.